That bread looks so delicious I can almost taste it! You are so creative!! I would never have thought about adding the peppers. Toasted with a sprinkling of olive oil ? I must make this !! That’s a bonnie looking loaf Wendy. Such a beautiful loaf of bread. It can brighten up any day indeed. What a gorgeous addition to a beautiful loaf of bread! I love the bright colors sprinkled throughout the slices! Gorgeous! This needs to be added to my “to knead” list. I love love love the colors. What a gorgeous combination of flavours, I’m liking smitoniusandsonata’s idea!! 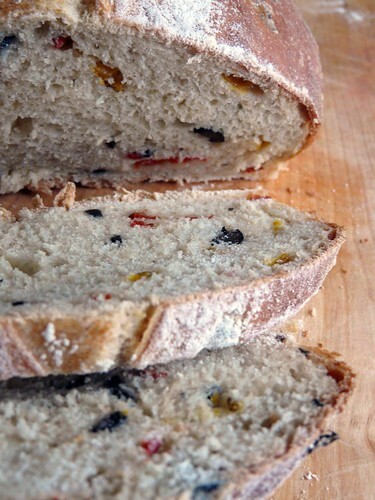 It looks really lovely, and the crumb looks great too – peppers and olives go so well together as a flavour combo. I must try this soon! 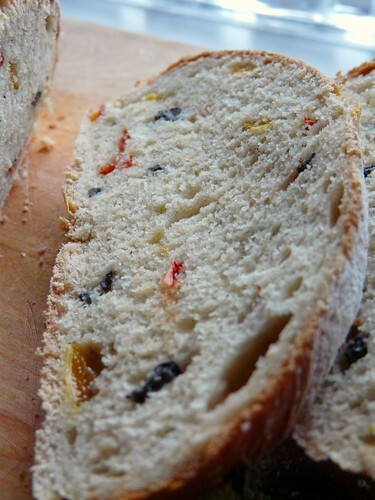 Just to add to my comment above, I’ve just clicked the link for the recipe, and it’s the one I use for my breakfast bread too! I have made it with 1/4 wholemeal flour and added 100g dried apricots, and it always makes a lovely loaf. It’s such a good recipe! smitoniusandsonata – Great idea. Tried it today with this bread and, yes, it’s perfect! 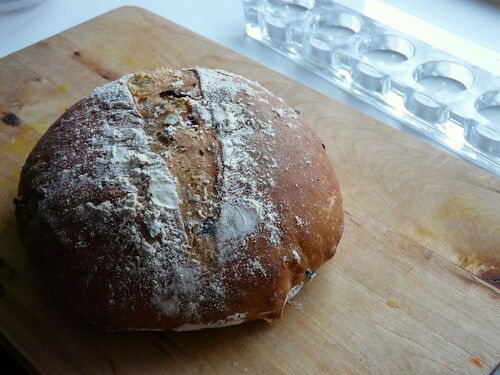 Johanna – Sturdy is the right word for this bread. It stays fresh(ish) all week long and is great for toasting. Maninas – It is a lovely breakfast break. Astra Libris – The colours are wonderful, aren’t they? Siri – A great compliment from a great baker! Noblenourishment – Tried the drizzle of olive oil and it WAS great. C – It’s a great recipe, isn’t it? The loaf look really delicious and thank you for the link to Dan Lepard, that has inspired me to try a few new ways in my quest for the perfect loaf.